I know I often talk about the social media machine, posting up to 22 times a day (that’s for Twitter) and engaging, engaging, engaging. But what happens when you need (Yep I said need) to go on vacation? As business owners and Entrepreneurs we all should make a point to step away from the craziness of building and running our own businesses. (Yes I am giving you permission!) Vacations are so important because these breaks keep your energy flowing, your creativity boosted, and ideas jumping so your business can expand, grow and thrive. So my post today is about 5 important steps to take so you can feel happy and carefree heading out on a healthy vacation with your family or on to a solo relax-cation. 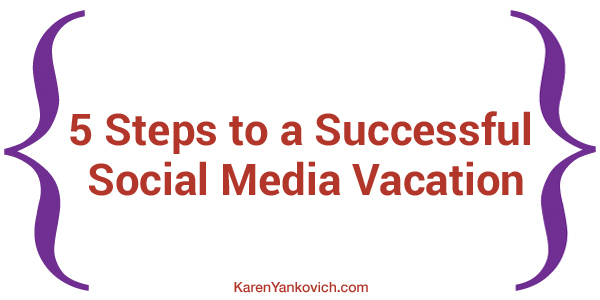 5 Important steps to take on social media for a carefree vacation. First: Schedule those posts ahead! I hope you are already using a scheduler to make your social media life easier. If not read my posts here and here that talk about my favorite apps to use and how to use them. Scheduling not only takes the bulk of social media posting off your plate, it allows you to focus on building engagement and the more organic posting that comes from finding trending information that crosses your radar each day. Make sure to schedule a lot of posts that are foundational in nature, meaning they are evergreen, they never “expire”. You can talk about this stuff for weeks and months because it is related to your business why, who you serve, how you serve them, and what they can expect when they hire you or buy from you. The aim here is to just be truthful and direct. If you are a one man show advise what the turnaround time might be for an answer to a question if a customer posts on social media. Give yourself some extra time in case of snafu (kids sick, hotel wifi out, too many margaritas by the beach) Your fans will appreciate this knowledge especially if they need to reach you for a customer service reason. You wouldn’t want to inadvertently create a frustrating customer service scenario where there doesn’t need to be one. Third: Check your social media a few times. Yes, yes I know. Terrible thing for me to say, and possibly pretty unpopular, but at the end of the day you are trying to grow a business and a sustainable one at that. So my advice? For the first couple years of this business growing phase take vacations where you know you can find wi-fi somewhere, somehow. After that when you are wildly successful and have a team to manage everything you can head off on that African Safari or to the middle of the ocean. But until then, make a plan to check up on your biz and social media at least a few times during your trip. Oh and make sure you pack your cell phone and computer chargers, pack them right now. You can hate me while you are doing it and then you can thank me later. Fourth: Hire that VA you’ve been wanting to hire. Starting to build your team is the best way to ensure that you can step away for a vacation, or more importantly for a family emergency, and your business won’t suffer. A VA can create, plan, and post to all of your social media sites, can be trained to answer most customer service questions (or at least soothe the customer until a real answer can be found), and most importantly keep your business humming while you are away. Sure you might field the occasional phone call when he or she runs into a roadblock that only you can authorize a solution to, but for the most part a VA can handle a lot of the little details of social media and incoming emails for you. Start interviewing and test-driving a few of these assistants today so you are ready to pack a bag and head out without looking back! Fifth: Share your photos later. Resist the urge to post vacation selfies of you looking amazing and perfect lounging on your amazing and perfect vacation. Be patient, take a lot of pictures, but don’t post them. Create a fantastic blog post that is peppered with the most beautiful photos of your trip, showcasing a product idea you had while lying on the beach (it’s happened to me!) or take the opportunity to create a personal behind the scenes post. Keep it professional and polished and this post (or posts) can have a nice effect on driving engagement your way. So what’s the very next step you need to take? That’s right! Join me in my LinkedIn group, where we can all help each other get the courage to take a vacation from our businesses… we can, right group?? We definitely CAN.